Prageeth questioned for 3 days on his book ‘Rajapakse family’-suspect reveals in his confession; how did the copy reach Gota’s hands? (Lanka-e-News- 11.Aug.2015, 10.30PM) The suspect sergeant major Ran Banda who was arrested day before yesterday(09) at Kurunegala in connection with journalist Prageeth Ekneliyagoda abduction and murder case, has in his confession to the CID stated, the latter was detained in the Girithale army camp and questioned for three days pertaining to the book he wrote about the Rajapakse family. After the abduction of Prageeth on 2010-01-04 night at Rajagiriya by two Tamil nationals attached to the intelligence division of the Girithale camp , he was taken to Girithale camp , and there Prageeth was questioned by him , Ran Banda confessed. This interrogation went on for three days , and the primary question centered on two issues: the book written about Rajapakse family by Prageeth which was to be printed ; and the other was about the ties that existed between Prageeth and Fonseka , Ran Banda in his confession had revealed. Thereafter , Major Siriwardena who was acting as the second commanding officer of the camp who was promoted to post of temporary Colonel had appeared and said ,’we have a trip to go with him,’ and taken Prageeth along with him. Since that point of time , he did not see Prageeth again , Ran Banda disclosed in his confession. Major Siriwardena was earlier working under Colonel Shammi Kumararatne, and it is the latter who had given instructions to the former, and during that period it was Colonel Shammi who had been the commanding officer of the Girithale army camp. Was it the book ‘Rajapakse family’ book that courted disaster for Prageeth? The book ‘Rajapakse family’ was written by Prageeth in view of the presidential elections at that time. This book is about how many of the Rajapakses have secured appointments under that government ; whether they have the requisite educational qualifications and so forth , about which topics people were not paying attention to. Mangala Samaraweera who was of the SLFP (M) faction at that time was in the ready to print this book . But someone had robbed the type setting copy of the proof that was being read at his Rajagiriya office. 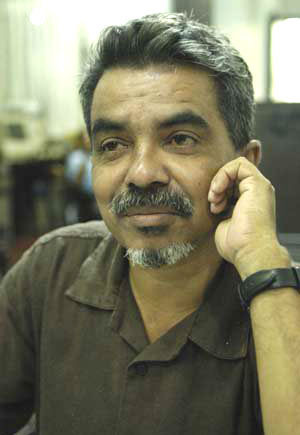 Later, showing a proof reading photocopy of that typesetting to Kelly Senanayake a famous printer and social activist, the CID questioned him, to learn whether that book was being printed by Kelly, to which question Kelly had replied he had not undertaken such a task. The CID had then asked him who had written that book ? Kelly had said he was not aware of that. During the days following Prageeth’s abduction, Kelly revealed to Lanka e News his suspicions in that connection. He said, he saw Prageeth’s notes confirming that he had been reading the copy of the proof and he identified Prageeth’s writing .In the circumstances , the crucial question is , how did this leak out ? After the CID resumed investigations into the abduction ,a journalist Keerthi Kumara Lokuliyana giving evidence at the CID disclosed that a copy of the book ‘Rajapakse family’ prepared by Prageeth had been robbed by Prem Kulatileke. When it was probed how a copy of a booklet in Mangala Samaraweera’s office even before being printed reached the hands of Gotabaya Rajapakse, the answer to it was found when it was discovered that Ruwan Ferdinands who was a secretary to Mangala for a long while had been in the secret payroll of Gotabaya. During that period when Lanka e News inquired from him about this based on the media exposures, Ruwan repudiated it. Nevertheless by now , the clandestine relationship between Gotabaya and Ruwan is well known. This was borne out by the series of discussions with Gotabaya that were published in the website of Ruwan Ferdinands boosting the image of Gotabaya even before the heat of the election defeat settled down. Ruwan Ferdinands has collected huge sums of money from Gotabaya by stooping to these sordid activities, yet a journalist of his who was involved in the media discussions revealed that she was not paid any money by Ferdiinands. Meanwhile, a shadow editor in England of Ruwan Ferdinands website had recently spoken to a high profile UNP politico and requested not to jail Gotabaya in case there a new government comes to power as Gotabaya is one who can do some work, and therefore can be used. When the whole country is demanding that the heinous crimes committed by Gotabaya be searched and he be put in jail, this request made by this bloke had baffled and perplexed the UNP upper crust politico. It is now very clear that since this bloke is functioning as Ruwan‘s shadow editor, a better or more unselfish request cannot be expected of him. Taking into careful consideration all the circumstances and the background relating to the robbery of the copy of the book ‘Rajapakse family’ written by Prageeth from the office of Mangala Samaraweera, it can be inferred who was behind this robbery and conspiracy.Following the discovery of the secret ties Ruwan had with the Rajapakses , Ruwan was dismissed by Mangala Samaraweera from the post of secretary to him. It is also now known why the media belonging to Ruwan is resorting to most sly and cunning schemes to distort the facts regarding the abduction and murder of Prageeth , and paint a picture that those crimes were the result of Karuna’s criminal activities. shame on these guys(media personnel)......traitors to the honest citizens.....they deserve the gallows.....along with there Masters!....we pray justice will be done....SOON!